You might have known her as Nancy R. Holtzman, part of the musical ensemble that played Southwest Florida venues as Celestial Harp & Flute since moving here in 2001, when the flute half of the team needed to attend to aging parents. 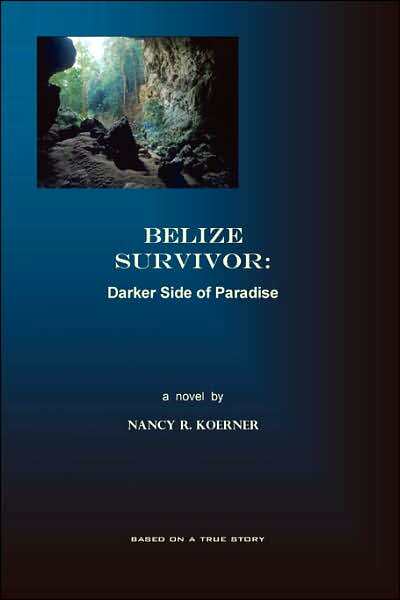 Now, Nancy R. Koerner is making her reputation as the author of the life-based novel called “Belize Survivor: Darker Side of Paradise.” The novel has three centers of interest: the effect of the 1970s counterculture on an adventurous young woman, the natural marvels of a relatively unknown Central American country, and the psychology of abuse. Koerner wrote the story from 1991 through 1995, then found a trade publisher who went out of business before bringing out the book. For a long time she shelved the project. Life, including a major accident, got in the way. But some ten years after putting it aside she revived it, further revised it, and has now made it available through lulu.com and also through standard and online booksellers. “Belize Survivor” follows the adventures of an idealist young woman, Alexis Dubois, who is far less worldly and far less informed that she believes. Influenced by the 1960s and 1970s interest in communal living, back-to-nature lifestyles, and other anti-establishment fashions, Alexis travels the counterculture capitals and by-ways, slowly maturing without losing her sense of adventure and her desire for personal freedom and fulfillment. The first third of the novel is a wonderfully evocative tour of the places and passions of the flower children, including Key West and Northern California. Alexis goes to Belize seeking Eden, a utopian lifestyle, but she finds instead the darker side of Paradise: earthquake, flood, fire, hurricane – and most of all the darker side of human nature embodied in a brutal husband, Max Lord. The seeds of this character’s decline into a sadistic abuser are not clearly perceived by Alexis, who seems to be avoiding facing up to what is obvious to the reader. But once she and her husband are in Belize, where Alexis is isolated and helpless, things begin to unravel. When Koerner (and her surrogate, Alexis) first went to Belize some thirty years ago, it was largely unknown and unspoiled. Much of that primitive, unspoiled beauty is captured in Koerner’s evocative descriptions. Indeed, evocation of place through vivid imagery and cultural atmosphere is one of the book’s major strengths. Another is the careful building and maintaining of suspense. There is always a reason to keep turning the pages. In writing the novel, Koerner tapped into the submerged emotions of her own experiences as an abuse victim. She came to realize that she had not fully addressed the issues, which she is now doing under professional guidance. The teller of an intimate story, Koerner felt that there were aspects of it that she could not render effectively in the first person. It needed the distancing and relative objectivity of the third person perspective. The third person approach also enabled her to better render the secondary characters. One of the problems with the choice is that Koerner succumbs to the temptation to go too far with one secondary character. Koerner’s extended treatment of Max Lord’s South African upbringing, interesting in itself, takes readers away from Alexis too long and makes too obvious the psychological seeds of later complications. Such a digression would be unlikely to happen in a first person narration. But this is a minor quibble. As one might imagine, Alexis wishes to escape the tortures of abuse. Complicating her decision is the growing shadow of self-doubt and her sense of responsibility to the two children she and Max have brought into the world. How Alexis handles these issues, which I won’t give away, lends compelling complication to the latter third of the novel. Whatever its future in other media, “Belize Survivor: Darker Side of Paradise” is a remarkable first novel both in style and substance. Philip K. Jason, Ph.D., is Professor Emeritus of English from the United States Naval Academy. A poet, critic, and free-lance writer with twenty books to his credit, this “Dr. Phil” chairs the annual Naples Writers’ Conference presented by the Naples Press Club. There are plenty of thrills and chills, twists and turns, in Tina Wainscott’s new suspense novel, “Until the Day You Die.” A young real estate agent, Maggie Fletcher, feels somewhat guilty for not trusting the complaints her sister had made about being the victim of a stalker. In order to make sure the alleged murderer, Colin Masters, meets justice, Maggie succumbs to the temptation of giving false testimony that leads to his conviction. While the cased against him is being developed, Masters starts threatening Maggie in his skillful, unprovable manner. By the time Masters is convicted and sentenced, Maggie’s relationship with the prosecuting District Attorney has been ruined, her employer has been harassed, and she has begun to fear for her own life and that of her son. Maggie relocates to a small town in New Hampshire far from the initial setting of coastal Portsmouth. She feels that she has no choice but to erase almost all traces of her past, take on a new identity, and start again. However, after three years pass uneventfully, she discovers that Masters was retried because of a technicality in the original trial – and this time found innocent. Not only that, he has already found her and initiated his diabolical plan of revenge. He even cleverly ingratiates himself to Maggie’s young son, another well-drawn character. Wainscott baits the hook skillfully, but I will give away no more. One of the pleasures of the book is the way Wainscott has developed her characters and story line through a shifting point of view. Maggie’s chapters are told in the first person. Thus, we can know directly what she is thinking and feeling. She confides in us, and she gains our sympathy. Colin Masters and other characters are presented in third-person narration, giving us somewhat less access to their interior lives. Still, we will discover much about the grotesque psychology and distorted genius of Masters. For all his hideousness, he becomes in Wainscott’s hands a magnetic center of interest. “Until the Day You Die” is another step in Tina Wainscott’s ongoing transformation from author of paranormal romance to mainstream romance to romantic suspense to outright thriller. The psychological suspense element is paramount. Yes, there is a romantic dimension to this new novel, but I wouldn’t expect to find it on the romance shelves in the bookstores. Wainscott did a good deal of research to insure the authenticity of her novel. She revisited Portsmouth, a town she has used in an early, unpublished manuscript. She also had a relative do additional research for her. For Ashbury, she did internet and map research, eventually visiting there as well. This dedicated author also researched the psychology of stalking as well as the prosecution of stalking cases. She even connected with a police officer in the county where the novel is set. These explorations helped her with the police and court angles, which took the most time. All of this preparation paid off, as Wainscott has delivered a first-rate crime novel with a strong sense of place, intriguing characters, and a high degree of verisimilitude. Naples native Tina Wainscott was one of the early subjects of the “Book Beat” column. 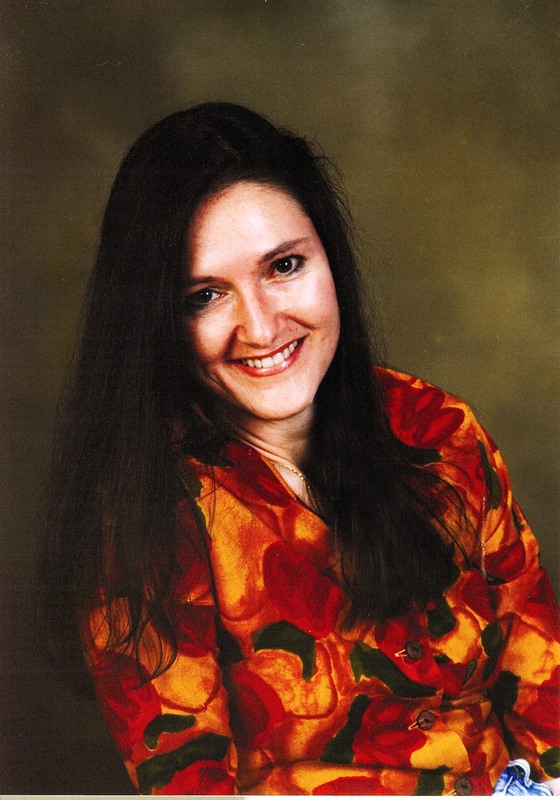 For biographical information and comments on her career as a writer, go to naplessuntimes.com and use the search tool to find the August 2006 column. Also, visit her website tinawainscott.com. 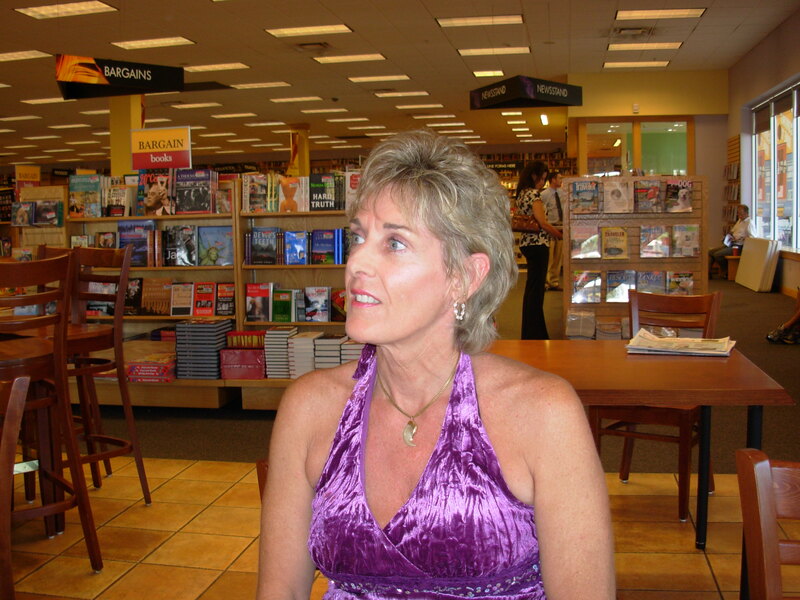 Meet Tina Wainscott as she signs her new book and other titles on Saturday, July 7 beginning at 2pm at the Naples Barnes & Noble. Pelican Bay resident Penny Lauer has been enjoying Naples since 1999, when she and her husband Bob relocated from Cleveland. This Ohio University graduate loves the array of activities available here. She volunteers for many groups, including the Shelter for Abused Women and Children. Also, she has organized a Salon of eighteen women who are writers, artists, designers, and collectors. They meet regularly to discuss their projects and encourage one another. One of these projects was her novel, “Bottled Butterfly,” which has just been published. Two years ago, Lauer discovered the Naples Writers’ Conference run by the Naples Press Club. She was impressed by the approach to publishing Bob Gelinas, head of Archebooks Publishing, discussed in one of the presentations. At the 2006 Conference, she took the opportunity to pitch a manuscript to him. Six months later, Lauer was offered a contract from ArcheBooks. 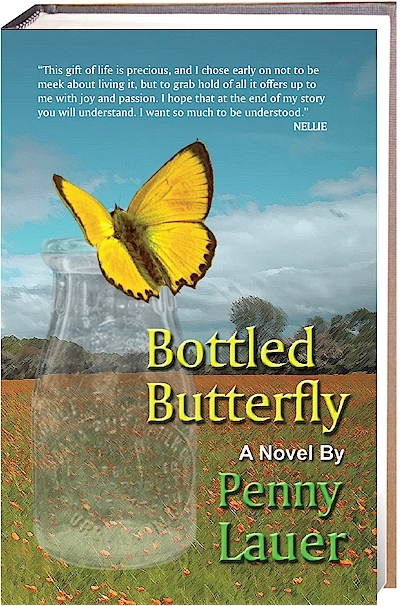 Through young Nellie, “Bottled Butterfly” tackles the impact of regional culture beliefs, poverty, illiteracy, and the dysfunctions of family life on children and how those issues influence behavior in adulthood. Set in the 1930’s and 1940’s in rural Ohio, the story vividly depicts the issues that confronted young women back then, and how they remain much the same today. Nellie is a courageous young woman whose deep inner strength and big heart drive an insatiable longing to achieve more than what others envision for her. There is a life tucked inside her mind that no one else can see, and her aspirations for her own daughter push her into making that life a reality. “Bottled Butterfly,” eloquent and lyrical, is a kind of wisdom literature in which the guilt and shame that follow Nelly’s trauma of being sexually attacked at the age of eleven are gradually transformed into positive, productive emotions. Lauer told me that the title “came about in a funny way. Almost 2/3 into the novel, I had Nelly talking with her father down by the railroad tracks, after a tragic incident between him and his son. Nellie had a sense that perhaps he, too, had been held back by circumstances that he couldn’t control. He let her know that he had just given up, and he told her that she should never give up or allow herself to get trapped. It’s a very poignant moment. Prior to that scene, I had Nellie explain to the reader that she was feeling all ‘bottled up.’ One night in bed, I woke up, shook my husband, and said that I had it. I had the title. It describes Nellie. She is the bottled butterfly. It fit perfectly.” The title gave the rest of the writing process needed focus. Before ArcheBooks accepted her manuscript, Lauer had a professional editor review it. This editor suggested minor changes and caught occasional slips in point of view. Once Bob Gelinas accepted it, Lauer was motivated to improve it even more before it reached the public. “I got really hung up then on the emotions of the characters, and I tried to make them as defined as possible. I asked four friends whose knowledge and wisdom I respect to read it and tell me their thoughts. Two of them wanted me to tell more about the brothers and Old Phoebe. I did up to a point, but I didn’t want to dwell on the brothers because I felt that doing so wouldn’t add anything to the main plot. I wanted Old Phoebe to remain somewhat of a mystery and let people really think about her.” All in all, the book was edited six times. Lauer received a great compliment during the writing process. A friend who had read the manuscript called to tell her that, while agonizing over a dilemma, she had asked herself “what would Nellie do?” Lauer is ordering mugs wearing that phrase. “Bottled Butterfly” is now available from online and standard booksellers as well as from archebooks.com.